Istria made its way to a touristic radar due to its beautiful coast, amazing beaches and simply gorgeous inland. Istrian peninsula is located on the Northern Adriatic between Trieste and Kvarner bays. There are three rivers in Istria called Dragonja, Mirna and Raša. The biggest mountain is located on the far north of the peninsula and it is called Ucka. Today, in almost every town in Istria you will find an abundance of accommodation units that vary from hotels, tourist resorts, private apartments, camps or holiday homes. Add to that the fact that Istria has an amazing gastronomical offer it becomes clear why every year this region of Croatia breaks records tourist-wise. .
1. National park Brijuni - 3 bigger and 12 smaller islands make the archipelago of Brijuni which is located in the south-west coast of Istria. Brijuni are known for their dense vegetation, safari park inhabited by rare animals and many archeological remains from the Roman era. 2. The heritage of Austro-Hungarian Monarchy - A tour of the Austro-Hungarian civilan architecture and military fortifications, boat trip, tour of the military-religious facility, all of these are available in certain destinations. 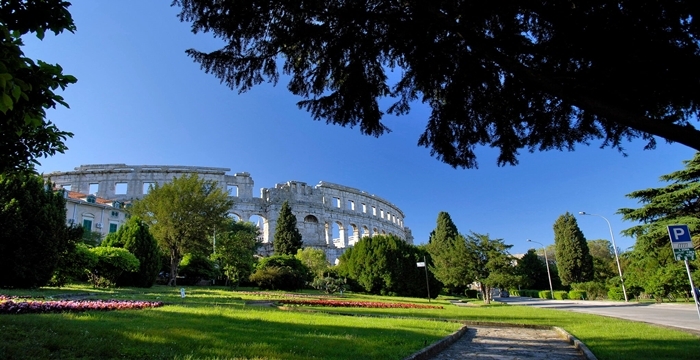 Most of the roman fortresses are reachable by foot and Pula is a home to several of them. 3. Amphiteater in Pula - surely one of the most significant Roman cultural and historical inheritance in Istria. The amphiteater was built in the first century and by its size is the 6th in the world. During that time the amphitheater was used as a theater for gladiator fights, whereas today it is used as stage for various cultural events, mostly concerts. 4. Agrotourism in Istria - The large offer of agrotourism in the inland of Istria is for those who wish to have a quiet vacation surrounded by the green, untoruched nature. There you can stay in typical Istrian taverns, called ''konoba''. The hosts will welcome you with Istrian food as well as good red wine, called Terran, or an exquisite white wine, called Malvazija. 5. Roads of olive oil and wine - Istria is known for its olive oil and wine. In fact, an old Istrian sayings goes ''bread for the body, wine for the soul''. Olive oil in Istria represents the symbol of good diet, and it is characteristic for its unique taste. There are many roads of olive oil and wine in Istria with purpose of showing the old oil mills and wine cellars to visitors. 6. 13th Festival of Dance and Non-verbal theatre - In a very short time, the festival has established itself as one of the most interesting events in the region which attracts numerous dance artists, experts, critics and, best of all a surprisingly numerous and loyal audience. Blue Istria is the coastal region of the peninsula, both east and west coasts included. There you will find plenty of beautiful coves with pebbly beaches, rocky shores and crystal blue sea. Blue Istria is home to some of the well-known towns like Pula, Rovinj, Rabac, Medulin, Poreč, Novigrad and Umag. Green Istria represents the inland of this beautiful peninsula. It is a lovely region made out of smaller hills and long valleys where local produces grow. Town Motovun is a perfect example of a picturesque little Istrian town that lies on the hill. We offer total 684 facilities.